Asian markets often carry these little beauties, but you’ll also find them, and many other interesting eggplants, at farmers’ markets. 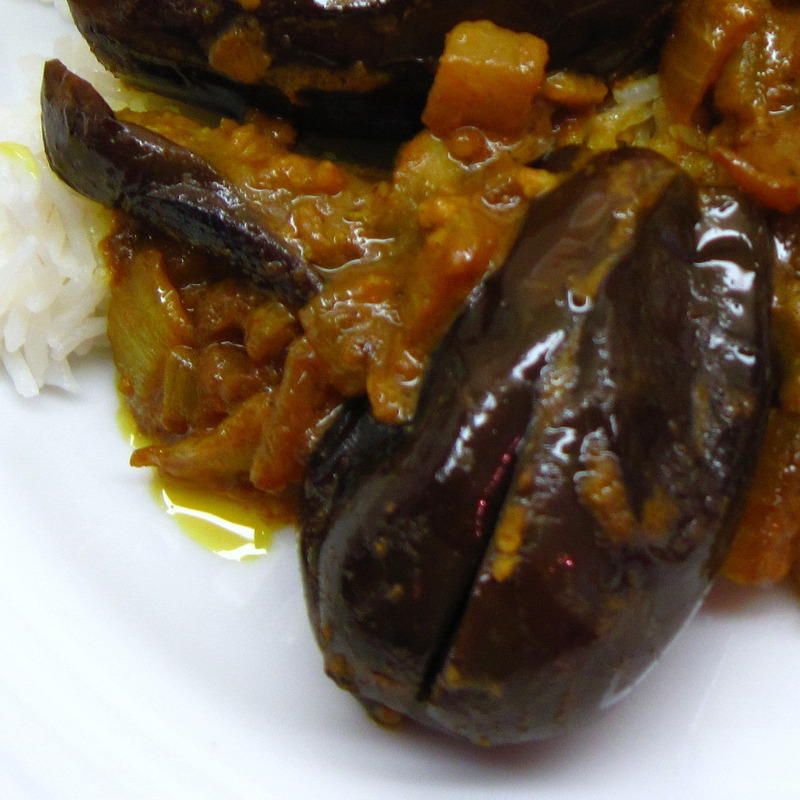 If you can’t find the Indian eggplants, any eggplant will work for this recipe. Just get about a pound and cut into smaller pieces if it’s a large eggplant. We love eggplant curry, so that’s what I decided to make. I found a recipe in 660 Curries for Baghara Baingan (Fried Baby Eggplant with a Peanut-Coconut Sauce). Raghavan Iyer’s recipe uses a peanut-coconut-sesame seed base. It sounds delicious and I may try Raghavan’s more complicated recipe someday, but last night I wanted something that was quick and easy. So I didn’t make Baghara Baingan; I made my own version of Curried Eggplant. This may not be a classic Indian recipe, but it does deliver authentic Indian flavors in an easy version that can be made quickly. And it was sooo good that I know I’ll be making it again soon! Update September 25, 2010: I made this again with 1 pound of regular globe eggplants (2 small ones) cut into 1-inch cubes. I left the peel on. It wasn’t as “cute” but was equally tasty. 1. 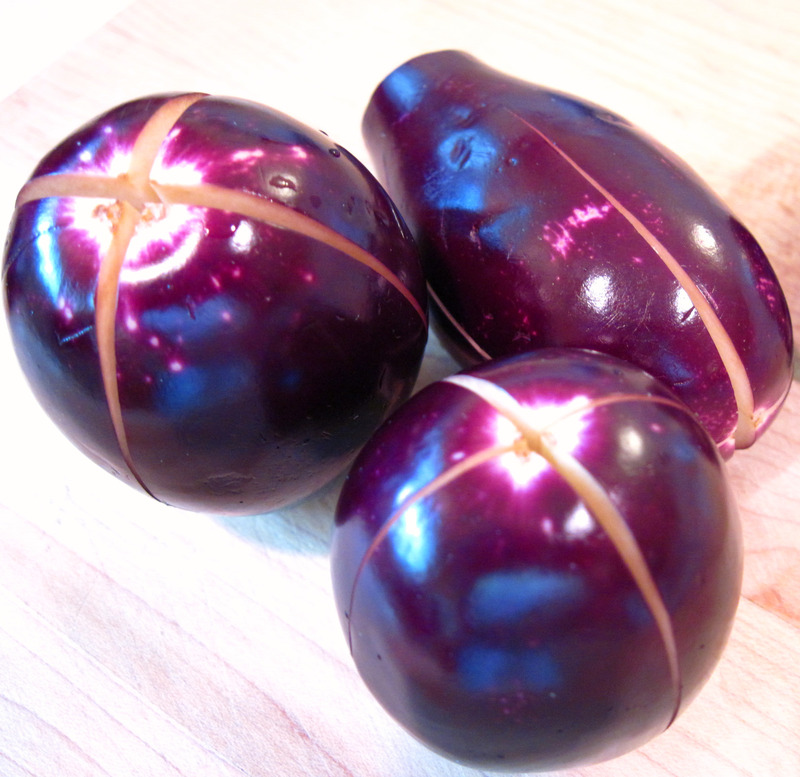 Wash the eggplants, cut off the top and then cut them lengthwise in fourths without cutting all the way through. 2. 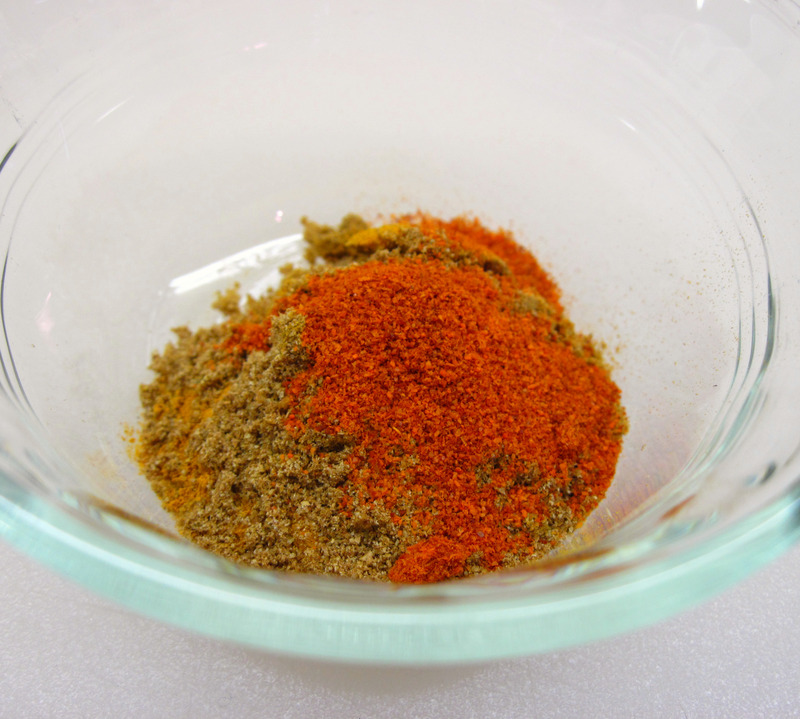 Combine the cumin, coriander, turmeric, and cayenne pepper in a small bowl. 3. Heat the 2 tablespoons coconut oil in a large skillet. 4. 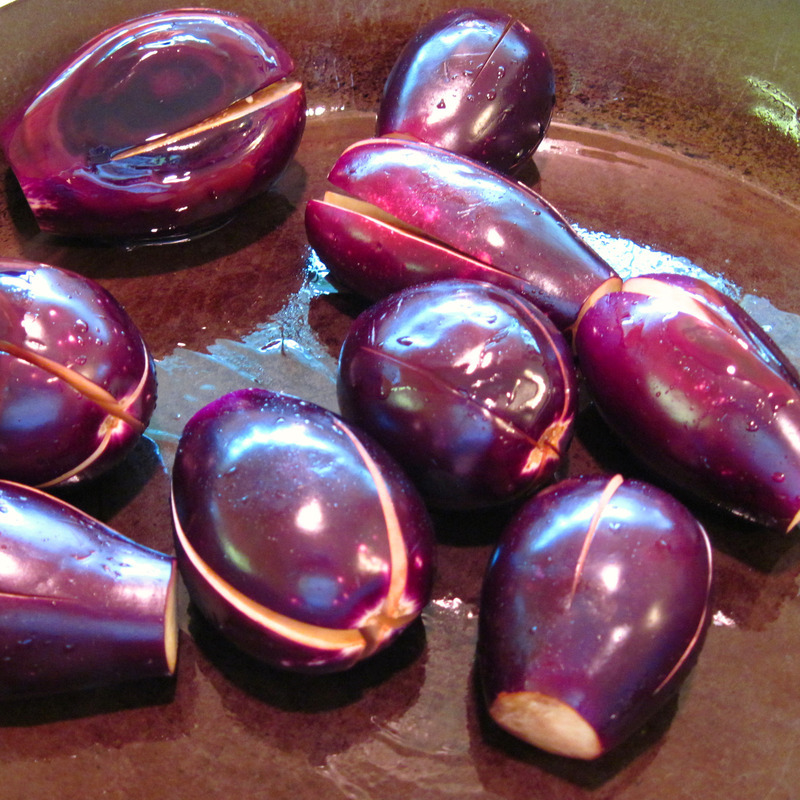 When the oil is hot, add the eggplants and cook, covered, for 15-20 minutes, stirring occasionally. They will be tender and soft when done. 5. 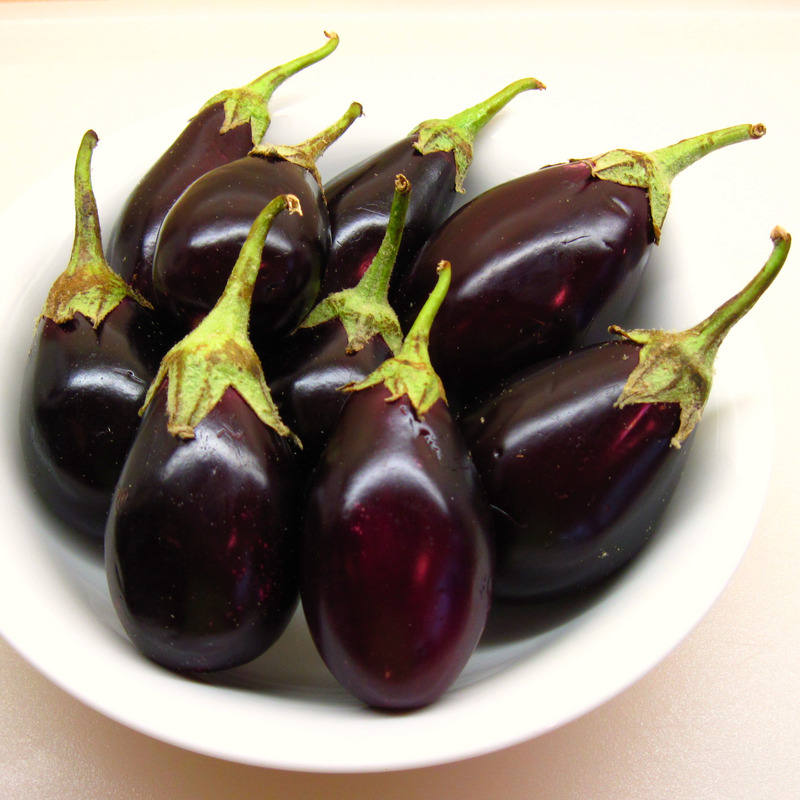 Remove the eggplants to a paper towel-lined plate. 6. Add 1 tablespoon coconut oil to the pan and cook the onions until they are softened, about 5 minutes. 7. Add the garlic and ginger to the onions, and cook, stirring, for a minute or so until they are fragrant. 8. Add the salt and spices and cook, stirring, for about a minute. 10. Add the eggplants and cook until everything is hot. Taste and adjust seasoning if necessary. Serve over rice. *In Seattle I can find small 5.46-ounce cans of Thai Kitchen coconut milk at PCC; I find them very handy when I’m cooking for just the two of us. 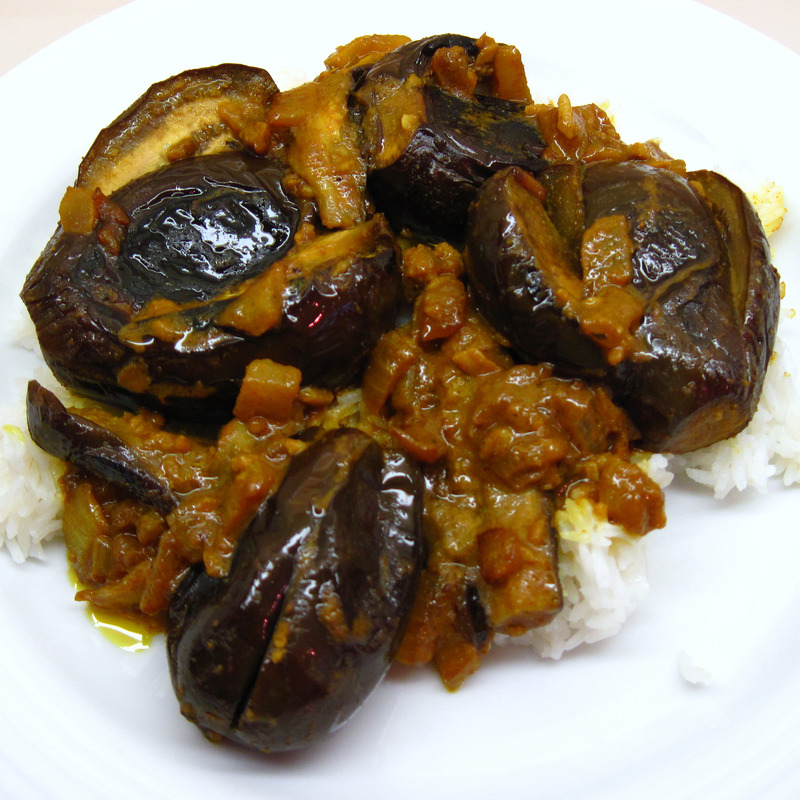 Wow, curried eggplants, I would love to try some of your delicious looking dish. My husband is not an eggplant fan so I rarely make it at home, maybe when he’s out of town, ha ha! I love those little eggplants!! your curried eggplant looks delicious!! thanks so much for sharing! Thanks, Dennis! It is delicious….even better than the finished photos look. hi this is an excellent side dish for Hyderabadi Biryani’s. excellent. this looks fantastic. and you made it look so easy! do you think i can replace the coconut milk with something else? i’m allergic to coconuts. Sure, Suzie! You could use ghee, butter or your favorite cooking oil for the coconut oil, and regular dairy milk for the coconut milk. If you want to keep it vegan, you could try a non-flavored, unsweetened soy or almond milk. We added some fresh chopped tomatoes (not too much), more onions, and some fresh chopped cauliflower (a handful) and wow delish! Great combo of spices 🙂 We might try to keep it down to 2 TB oil total next time. The cutting technique is perfect, TY for the pictures!! Thanks for your comment, Adrian! A few tomatoes, more onions and cauliflower would be delicious! Coincidentally, I also did an Eggplant dish recently Hearty Brinjal Recipe With Dried Scallops . However, the eggplant you used is a little different. The type commonly found in Singapore is the longer version. I like the look of yours, more like a fruit 🙂 I shall try cooking with curry one of these days. Thanks so much for your comment! Your Hearty Brinjal Recipe with Dried Scallops looks very interesting! Here, the large globe eggplants, and the slender eggplants like the one you used are most common. Other shapes are available at Asian or farmers’ markets and they’re fun to use. Can I replace the cocnut milk with another ingredient for this recipe? Sure, Lisha! You could use regular milk or plain (unflavored) soy milk or almond milk. First time at your blog. These eggplants came out real good ! Well, welcome, Aathira! And I’m so glad you liked the eggplant! Just came across those adorable little eggplants in the store and had to buy them. Came here looking for what to do with them. Thanks – looks delicious! I made this after I scored some of those beautiful little eggplants at our local farmers’ market store. IT was WONDERFUL. Thank you so much for sharing. So glad you liked it, Ginny! Love those little eggplants! THIS IS A WINNER-THANKS! When I made it a second time, I opted to use a 28oz can of finely diced tomatoes for the liquids and flavor. After the onions were softened and before adding the garlic and ginger, I added a tsp of black mustard seeds and a handful of rough chopped fresh curry leaves. Just before adding the eggplants, I stirred in 2 T of shaved coconut. My point in mentioning these alterations is only to praise you in presenting a dish that lends itself to adjusting toward personal tastes. You recipe stands on its own as an outstanding dish- either will go well with my chicken biryani. I forgot to mention the tomatoes and liquid were in lieu of the coconut milk. On a cold, rainy day here in Vancouver, BC, this dish really just hit the spot! It was delicious, comforting, easy to make. I’m in the midst of writing school papers and I’m very thankful that I found your recipe! Those baby eggplants were sitting in my fridge for a few days and now finally put them to good use 🙂 I will certainly make this dish again. Looking forward to my next visit to your blog. Thanks!